I've taken a look at your logs and what I can see is that any process that attempts to start is immediately being terminated with a SIGKILL. This doesn't appear to be an issue with the Emby Server package. Is there anything about your system you can shed some further light on? *embysvr is not administrator,also not part of http group. Only part of users group. *Emby Library NOT in dedicated shared folder for embysvr user, rather in my shared folder with individual folders for tv, movies etc. Oh that is ODD. I can't think of anything strange. It's running the cloudsync package to backup data to Backblaze, and it's got an iscsi lun running to support a couple of virtual machines, but there's just barely any disk i/o. There's the OAuth service, but I halted that and cloudsync and it still fails. I'll restart the NAS later today (when my partner isn't watching movies) and I'll let you know what happens. Thank you for the help! Restarted, no luck. Updated to latest DSM, no luck. What's odd is that something is sending a SIGKILL now, when before the app would run (but just have the network connectivity problems). Got this NAS about 6 months ago, so it's not been in use for that long, either. It is a little curious, but I'm sure we'll get to the bottom of it. How does the memory and CPU utilisation look like at moment? Can you run the diagnostics and send logs utilities again, just to make sure nothing has changed. Edited by solabc16, 13 October 2018 - 04:05 PM. CPU is bouncing around between 10-15%. 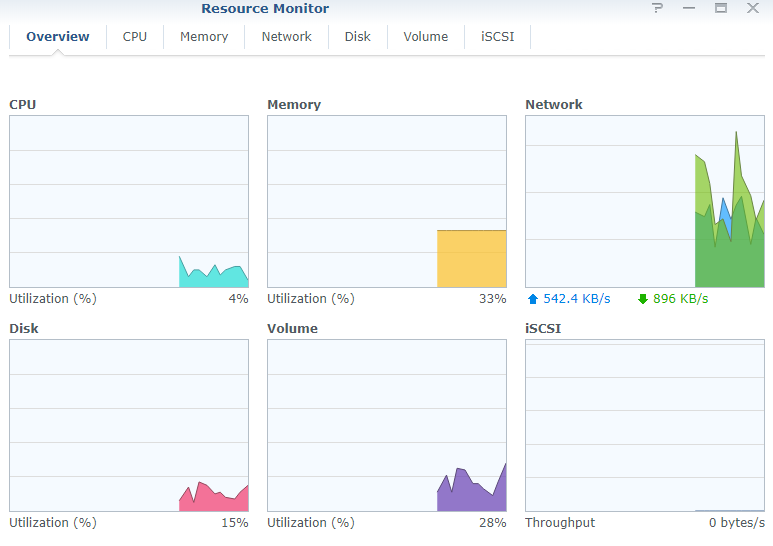 Memory usage is at about 35% as cloudsync is running, but when it's not there's almost no memory usage at all. You still can't access the internet? This thread has gone off on a bit of a tangent. I'm picking up @VincentVanGozer's issue directly, as it's something else entirely and seems to be a system issue. @anupam_r_k's system seems to be working ok now, but has raised a couple of observations here: https://emby.media/c...ernet/?p=635050. There are no changes that would influence performance between 3.5.3.0-6 and 3.5.3.0-8. I've taken a look at the logs and everything appears in order, as noted above there are no changes that would influence performance between 3.5.3.0-6 and 3.5.3.0-8. There are a handful of metadata errors in the logs, however these are 'normal'. I have seen the collages 'disappear' before, but they've always been regenerated at some point without manual intervention.